Beth: You've lived here your whole life? Beth: You've never gone anywhere? Sid: Traveling has no allure to me. In these days of multi-million dollar movie star salaries, nothing pleases me more when highly paid actors do a film for merit rather than moolah. Even more impressive? When the finished project turns out to be worth the effort. Bodies, Rest and Motion is such a film. A quirky, offbeat 1993 "dramedy" set in the small desert town of Enfield, Arizona, it chronicles two days in the life of a live-in couple getting ready to haul their belongings to Butte, Montana. Nick (Tim Roth) is a restless TV salesman anxious to head to the so-called "city of the future" ("I read that a while ago, so the future should be there now"); Beth (Bridget Fonda) is his go-with-the-flow girlfriend of three years who's equally itchy, yet prefers to not spoil her daily routines and face the rigors of change. Next-door neighbor Carol (Phoebe Cates) is her best friend and Nick's old flame, a former relationship that Beth still wonders about. Into the middle of this unspoken triangle emerges Sid (Eric Stoltz), a laid-back house painter arriving a day early to start work on the soon-to-be-vacated premises. Initially cool to his small talk, Beth's mannered exterior is slowly melted by his charm. But her happy mood is soon halted when Carol brings word of Nick's premature solo departure with no plans of returning. After a girls' night out, Beth returns home to find Sid still on the job. During a break, the two have a wide ranging, soulful conversation in which he floors her with the revelation that he's never set foot outside the Enfield city limits, adding, "If you stay in one place long enough, your luck knows where to find you". Somewhat of an oddity in the filmographies of its participants, don't let its cult status fool you. 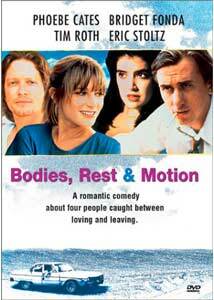 Bodies, Rest and Motion remains a dryly funny and highly evocative movie that will surely bring back memories for Generation X-er's who recall the boxed-in feelings of their late twenties. With the possible exception of his work in Pulp Fiction, Stoltz has never had a more appealing role as the sweet stoner and painter whose pink-eyed front hides the heart of a free-spirited romantic with an offbeat sense of humor; look at the way he almost causes one time off-screen love Bridget Fonda to almost lose it while talking about paint fumes in Chapter Four. Speaking of Fonda, she's equally affecting as the passive woman whose "restful" world comes unhinged thanks to her johnny-come-lately. Although their roles are disappointingly underdeveloped, Cates and Roth overcome such flaws with sharp performances; future Sopranos temptress Alicia Witt has a small but very pivotal part as the young girl who helps Nick rediscover long pent up emotions pertaining to his past. Despite a sluggish start, the film quickly finds its groove and only gets better as it progresses; the quick paced 95-minute running time smooths over any misgivings I had about certain storylines. Bernd Heinl's dazzling location photography is alternately beautiful and stark as it encapsulates the feelings of the characters perfectly, while Michael Convertino's offbeat, mesmerizing tribal-chant-influenced score is one of the most underrated of the 1990s. Image Transfer Review: On a whole, the image is pretty good; crisp colors (especially during cinematographer Heinl's luscious roadside visuals), good detail, natural fleshtones and fairly accurate black levels. However, a faint gauze of noise tends to come and go (particularly in darker scenes and occasional close-ups) that proved distracting. Then again, to paraphrase the classic Seeds tune included on the soundtrack, I may have been "looking too hard"; while listening to the commentary, such abnormalities didn't seem that bugging at second glance. Still, with a little more work this transfer could have easily upgraded to "A"-level status. Audio Transfer Review: Now, here's the star of our technical show. With no less than three audio options to choose from (including the original 2.0 Dolby Surround), the DTS track is an absolute stunner with its amazing spaciousness that puts the "surround" in surround; the Dolby 5.1 cousin gets lost in the Arizona tumbleweeds by comparison. From the subtle ambience of background activity in the diner to the encircling chants of the incidental score, this is a terrific mix and surprisingly active for a dialogue-heavy film. Extras Review: A laid back yet informative commentary takes supplemental honors. Director Michael Steinberg, screenwriter Roger Hedden and star/producer Eric Stoltz hold court on a mostly screen-specific journey that takes us through the project's local stage play origins to independent film stature. Amongst the usual talk-a-thon clichés of mistakes and lucky accidents are engaging stories, including the surprising chemistry between Cates and Roth (it also surprised the skeptical filmmakers), why Tucson was chosen as a backdrop, and Stoltz's clout in assembling the principals. Although his presence is limited (all three participants were recorded separately, by the way), the actor provides many of the track's highlights with his refreshing candor on stylistic disagreements with Hedden and Steinberg as well as somewhat self-depreciating thoughts on his performance (owing to his double duty responsibilities as one of the producers). Such thoughts may come off as egotistical to some, but in a commentary world filled with kissy-kissy participants, I found Stoltz's honesty to be refreshing. In addition to the usual trailer material is a six-minute featurette shot at the time of the film with all the core cast revealing what attracted them to their parts; Behind-the-Scenes, which provides a fascinating B-roll look at the making of two pertinent scenes (Fonda, with a hand-held fan, looks like she's either having a hard time dealing with the Arizona heat or storing up her energy for her show-stopping scene in the movie's final third); Rehearsal Footage offers the appealing concept of watching a key moment in both rehearsal and finished form via split screen, with the added option of separate soundtracks for comparison's sake. Very cool! One of the 1990s most underappreciated comedy-dramas finally surfaces via Image's well-done special edition of Bodies, Rest and Motion. In spite of the spotty transfer, the excellent performances and better-than-average supplements add up to a disc worth owning for the film's devotees.